The best hoverboard is one that is safe while still being incredibly fun. After all, the general point of a hoverboard is to have a blast while riding them. Regardless, there is an elephant in the room regarding this product. It's gotten a lot of bad press and known defects which can't be ignored. That's most of the reason why this list was put together. If you are looking for the best hoverboard to buy, then you definitely want the safest one. While this list doesn't have them in order from best to worst, we do provide a variety of the best hoverboards for you to choose from and discover what you like more with your budget. This is your first stop to buy the best hoverboard around. 1. WHAT IS A HOVERBOARD? Don't get confused with the fictional element here. The hoverboards talked about in this list and hitting the market as we speak are self-balancing scooters with only two wheels and no handles. 2. WHAT DOES A HOVERBOARD DO? These hoverboards are designed for fun and transit, to get you from Point A to Point B in style. 3. HOW DOES A HOVERBOARD WORK? 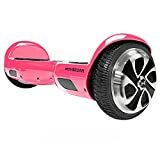 The rider stands on the center of the hoverboard with each foot against each wheel and tilts their body gently in the direction they want to go. Each wheel is powered by a motor, usually a 250W, to move. 4. WHERE CAN YOU BUY THE BEST HOVERBOARD? 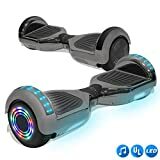 The hoverboards on this list are all available on Amazon, but you can also find hoverboards at manufacturer websites or retail stores. As always, these hoverboards were reviewed with safety first in mind. Second comes price and function. That said, all of these hoverboards come with dangers and risks, even the best hoverboards, so be aware of the product before you make a final purchase. Like with most products, you get what you paid for. The quality of the board goes up with the expenses put out. However, keep in mind the hazards of a hoverboard, even the best hoverboard you can find, and comparisons to all competitors. Just because one is expensive doesn't necessarily mean it's better; but that seems to be the case with most of these. The Hovertrax is the self-proclaimed smartest self-balancing electric scooter in the world. The unique aspect comes from auto-leveling technology to create a safer and easier ride. The battery can last for up to an hour on a single charge, reaching a maximum speed of slightly over eight miles per hour. A longer ride can be easy by quick-change 36V batteries. The board is able to support riders up to 220 pounds. There are LED lights, fender bumpers, and two riding modes with beginners in mind. Limited warranty lasting 90 days from the date of purchase. You can sometimes buy an extended warranty through a retailer, but the manufacturer will not honor it. SEGWAY is an old, reliable brand that tries to put safety first in their products every time. This includes the precautions put in to their miniPRO. This hoverboard comes with an app featuring remote control, alarms, speed settings, lights, and diagnostics. The top speed on the miniPRO is ten miles per hour with a range of about thirteen miles. It's able to handle many different terrains like slopes and obstacles, and even has different mode settings for beginners to learn. The payload is set at 220 pounds. This board has a bar in the center to go between the rider's knees for better balance and steering. The board itself has a warranty of one year from date of delivery. Extra attachments will be under a ninety-day warranty. MORE POWER - EPIKGO has 400W Dual Motors that help it climb slopes as steep as 18 degree and last over 1 hour and over 10mile range on a single charge, making it the most powerful balance board on the market. GO ANYWHERE - Solid rubber tires for all- terrain purposes. Rated IP56 for solidness and water resistance. Easily maneuver through grass, mud and sand on the board built to do more. EPIKGO's board has undergone 159 safety tests to minimize chances of a fire hazard, making it another very safe board for our list. This board can traverse almost all terrains, able to handle eighteen degree slopes. Battery life lasts over an hour with almost a ten mile range. It's even able to charge fully in two hours. This board is also pretty big, making plenty of room for the power beneath your feet. The limited warranty is for one year. UL 2272 Safety Certified Hoverboard, The UL certified hoverboard meets UL2272 standards for quality charging and electrical performance. Charger included. High intensity LED headlights provide you safer ride at night, now you can ride it to anywhere at any time. Built-in wireless speaker can be easily connected to portable devices in second, just enjoy your favorite music or books without wearing headphones. Make your hoverboard the coolest one with extraordinary sound effect. This hoverboard, coming in a variety of colors, has high intensity LED headlights for riding even at night. It also comes with built-in Bluetooth speakers for listening to whatever you want without headphones. It has a max speed of about seven miles per hour and takes about three to five hours to charge. The limited warranty only covers 30 days. The TOMOLOO hoverboard has a fire-retardant shell and a battery that won't overheat or short-circuit, creating great protection against fires. While also have a Bluetooth speaker, this board can reach up to twelve miles per hour for a range of about twelve miles. The LED lights have controls through the app to change colors or toggle on and off. The board is even water resistant. 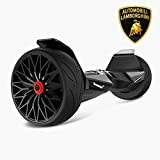 Hoverboard designed for the ultimate drive:Larger & More power - Lamborghini is nearly 2x more powerful and 33% larger than the leading competitor meaning more foot space, a more stable ride and more fun. Plus the truly stunning led design,the best in its class.Together we are extraordinary. Comprehensive Safety and Security:Every hover board is designed and built to provide world-class levels of safety and security, a top priority for Lamborghini. UL 2272 tested and certified self balancing board with UL2271 Certified Smart Battery. Strictest Production Process,hundreds of thousands of tests regarding to safety regulations. 8.5" hoverboard SUV Tire:UNRIVALLED ROAD PRESENCE,this big all-season tire delivers great stopping power, grass,durability, and traction, even in light snow.You'll feel safe.No matter what sort of road you're in.Rated IP54 for solidness and water resistance. Another passer of the UL2272, this board has going through 159 safety tests. 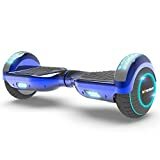 Along with the LED lights and capacity to hold 226 pounds, there is a gyroscope self-balancing system in the board to always keep the rider vertical. This board can handle many terrains and sixteen degree slopes. It has a range of about six to ten miles. The limited warranty is for one year and there is a 30-day money-back guarantee. The Bluetooth app allows for riders to access a map function, check diagnostics, play music, or change modes for beginners. The board can reach about eight miles per hour for a range of eight miles and carries about 220 pounds. The most impressive aspect is the all terrain features, which allow the Swagtron board to climb slopes of up to thirty degrees with two 150W motors. The GOTRAX board has LED lights for visibility and seven different colors and designs to choose from. It can also reach almost eight miles per hour for a range of twelve miles or over ninety minutes. It has two 250W motors and is safety certified. The limited warranty is for 90 days but you can get a one year extended warranty. The HOVERZON board can reach speeds up to eight miles per hour and has a range of about eleven miles with support for 220 pounds. This one is also safety certified and has a self-balancing technology built in. Comes with LED headlights, riding modes for beginners and battery indicators. The two motors are 250W and it has non-slip foot rests. 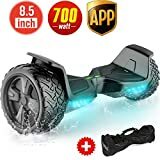 If you're looking for the best bang for your buck and the best hoverboard, you might want to go with the SEGWAY option. While it is more expensive and has more problems than some others, it's also a tried-and-true company with lots of experience and a good reputation. If you aren't convinced, the CHO may also be a good bet. Regardless, buy wisely and stay safe. Even the best hoverboard can have unforeseen problems.